MR AND MRS THOMAS ARTHUR. Mr. and Mrs. Thomas Arthur, “Mr. 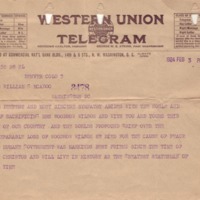 and Mrs. Thomas Arthur send their condolences to William G. McAdoo,” 1924 February 3, WWP19608 , Eleanor Wilson McAdoo Collection at the University of California-Santa Barbara, Woodrow Wilson Presidential Library & Museum, Staunton, Virginia.